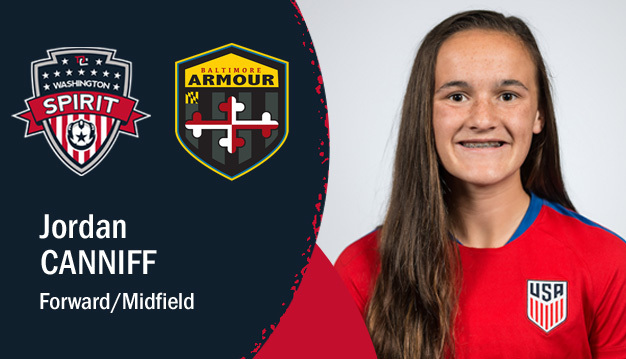 Boyds, MD (February 20, 2018) – Washington Spirit Academy – Baltimore Armour forward Jordan Canniff contributed three assists over the course of a three-game sweep for the U.S. U-17 Women’s National Team at the Copa Provincia de Buenos Aires in Argentina. Canniff recorded her first assist during a 9-0 rout of host nation Argentina in the tournament opener on February 13, while playing the full 90 minutes. The USA followed up with a 4-1 victory over Uruguay, with Canniff providing assists on two of the goals. She first set up a Samantha Meza goal in the 27th minute, and then made the final pass to Isabella D’Aquila ahead of her 45th minute strike. Canniff and the USA went on to finish the event with a 1-0 win over Chile to capture the tournament title, behind a lone goal from Samantha Kroeger. The team outscored its three opponents by a combined total of 14-1 overall.